A pair of solid walnut armchairs from about 1925 was made for the Sioux Falls, SD courthouse. One of this large group was signed, "Y. H. Gunlocke Chair Co., Wayland, NY." The excellent renewed finish is satiny. Reglued to serve another generation, this rugged vintage office or library furniture is American made. Curved lumbar spindles and the sculpted seat are very comfortable. Measurements are 24" wide, 24" deep, 33" tall and the seat is 18" high and 18" deep. 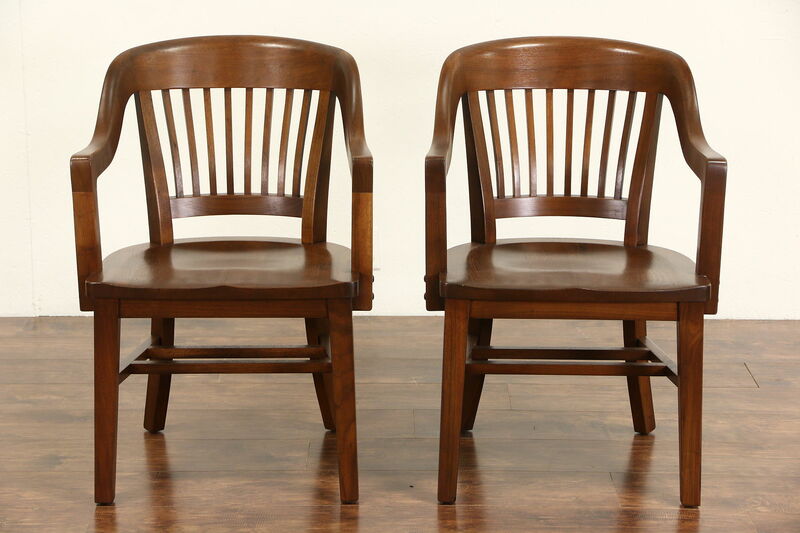 Matching single and pair of chairs in linked photos are priced and sold separately, call or email for availability.